We love checking Instagram and seeing how you guys style McGee and Co. products! We love seeing them incorporated to your spaces in new and different ways, and it never fails to inspire us. Today we're sharing some of our favorite shots! Make sure to tag us and #mcgeeandco in your pictures for a chance to be featured here or on our Instagram stories! We just styled the kitchen of Rachel Parcell, and love how it turned out! In this shot you can see the Extra Large Bowl in Pink, Reclaimed Wood Cutting Board, Marble Cake Stand, Round Floral Jar, Recipe Box, Berry Baskets, and Canyon Crock. See more pictures on her blog here! Isn't this a pretty view of our Perfect Stripe Pillow? You can also get a glimpse of our Morris Lantern too! We designed this project through our E-Design Services for Doreen Corrigan. 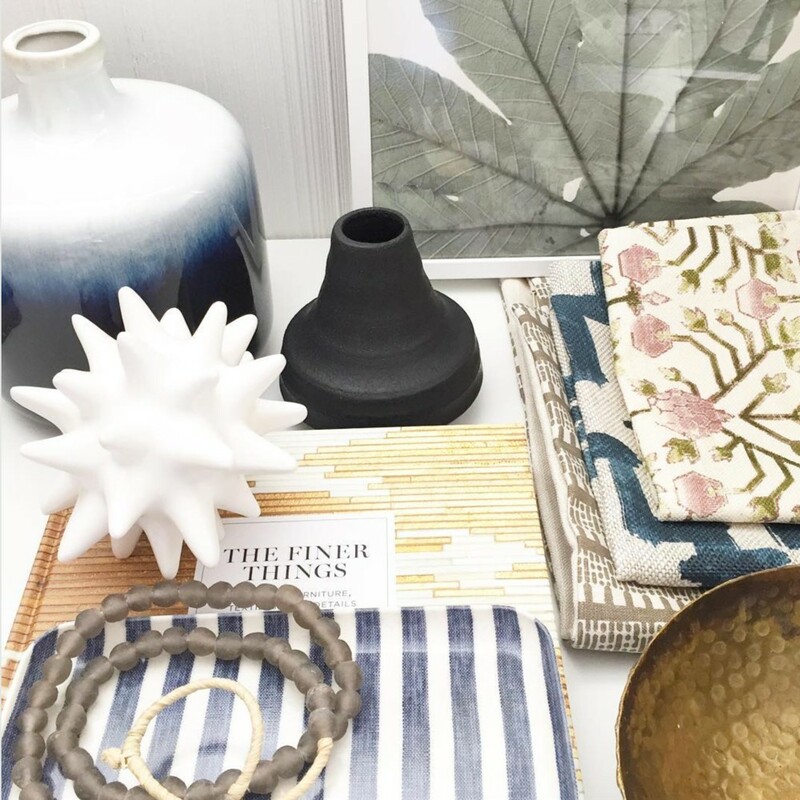 From the Based in Blue Vase to the White Sea Burst paired with our Sea Glass Beads and Striped Tray - we love the layering happening here! If you look closely you can see our Indira Brass Bowl peeking through too. This stunning room is full of McGee & Co! 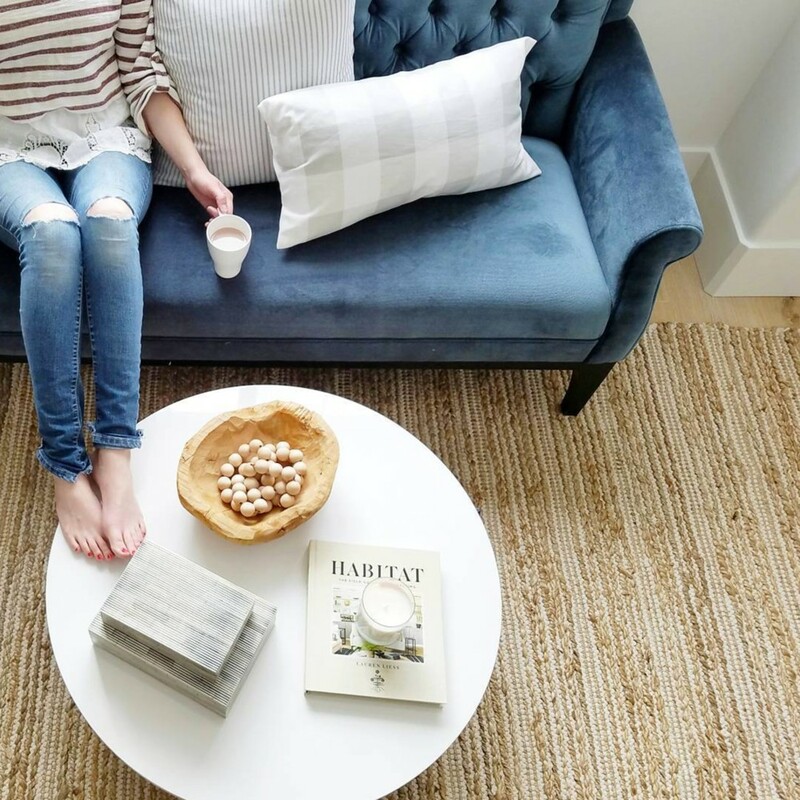 We love the Fern pillow paired with the Perfect Stripe pillow! The Lebon Floor Lamp looks so chic when placed next to the paired Botanical Prints — proof that black and white doesn't equal boring! The beautiful florals on the mantel are displayed in our Tinted Sage Vase. It's hard to know who's doing a better job of of stealing the show here, the Jacqueline Chandelier or the Open Ocean art piece. The abstract oceanic colors really bring out the bright acrylic beads in the chandelier and brighten the space in more ways than one. The Golden Tulum Pots stole out hearts the moment we saw the subtle etching that wraps the base, making a statement and adding pattern without overdoing it. We love how it contrasts against a navy wall!! This glamorous and moody sitting area is doing everything right. The Velvet Pillow in Blush is soft and bright, it juxtapositions perfectly with the dark details. Florals and gold are always a stunning duo, and this photo is no exception! We love seeing the Nina Tapered Lamp styled next to something equally as beautiful. 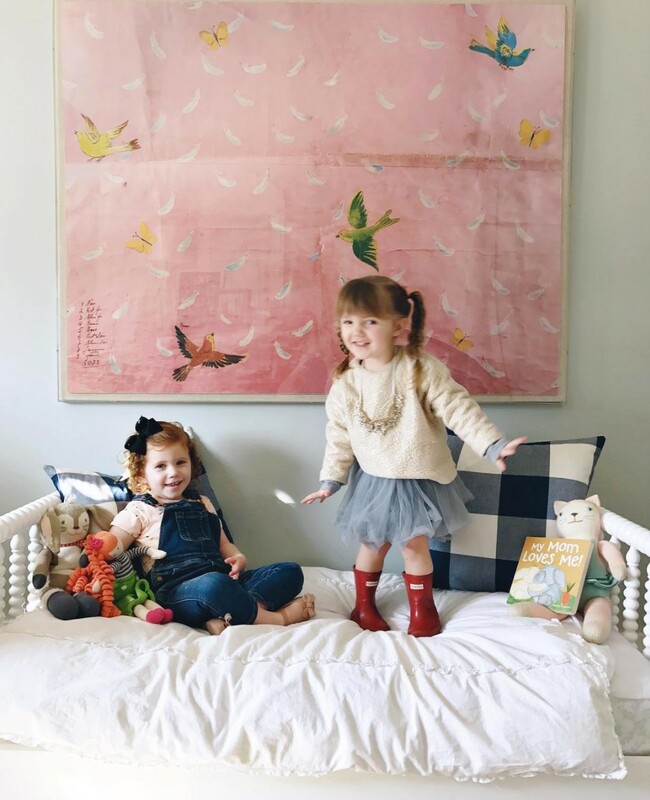 Birds and Feathers makes the perfect backdrop for a playful scene like this one for Sweet Peach Kids. The Oversized Check Pillow is another fun addition! 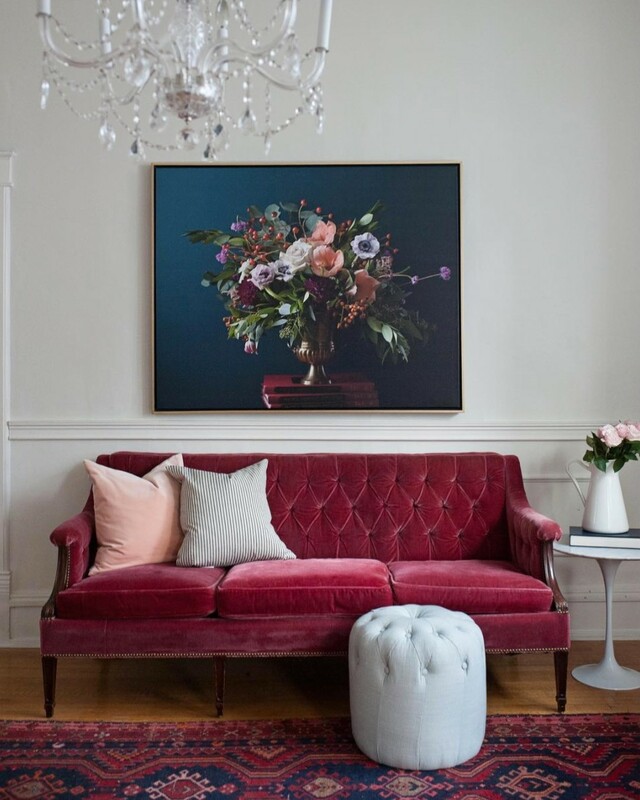 Our Faux Magnolia Branch pairs so beautifully with this soothing painting! You can't go wrong with a touch of gold. One of our favorite sculptural accessories, Scribble in Gold, brings playfulness and dimension to the flat layout. We love to spot McGee & Co. decorative objects in good open shelf styling! Here you can spot our medium sized Found Vase, White Base Cement Pot, and Gold Chain Bookends. Our Oversized Check Pillow and Velvet Pillow bring not only comfort, but warm texture and pattern to this cozy bench. The Dark Green Vase completes the look. The use of beads here is perfection! Our White Base Cement Pot has the "found" look that beads do, and brings natural texture to this perfect bedside setup. We share more tips on styling with beads here! We saw so many people reposting this photo on Instagram and we can see why! 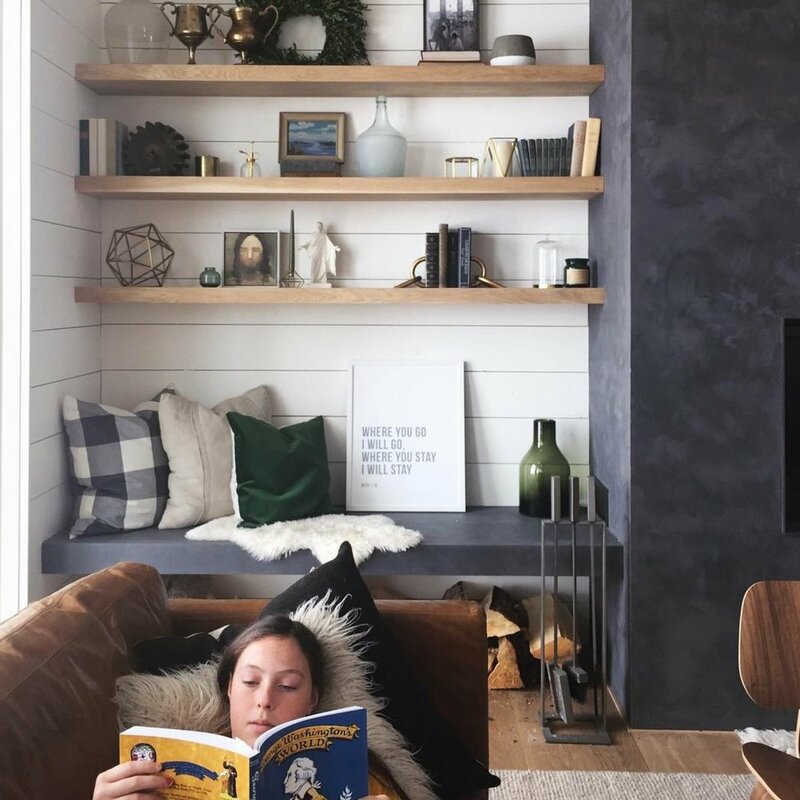 The dark hues against the bright white shiplap creates a bright yet moody space we totally love. You can spot our Oversized Check Pillow and Velvet Pillow in Emerald. We love this close up shot of our Gold Feather Magnifying Glass and In Detail coffee table book. One of our most popular rugs, the Numa can be seen in the background, we love how soft and natural it looks under the Tory Coffee Table! How nice does this look right now?! Our Square Stripe Boxes are perfect for a space like this because they provide form and function. They're a sneaky way to add in some extra storage while also enhancing the design! Pillow styling can make or break a beautiful space, and we think this space is perfect! The Abstract Flora and Velvet in Navy pillows are shown here. They bring the perfect amount of color and texture here.